4specs - Directory of construction products provides fast and reliable access to manufacturers' websites. Access and use information about their "specified" products for your projects. Links to 3,515 manufacturer websites and 300 associations. Advanced Building Technologies and Practices - A building professional's guide to more than 90 environmentally-appropriate technologies and practices. Architects, engineers and buildings managers can improve the energy and resource efficiency of commercial, industrial and multi-unit residential buildings through the use of the technologies and practices described in this web site. aecportico - UK guide to architecture, engineering and construction. AGC Contract Documents: DocuBuilder - The Associated General Contractors of America (AGC) publishes an expansive array of standard form contract documents and related materials that address the different tiered relationships and project delivery approaches found in today's construction environment, such as general contracting, subcontracting, program management, construction management, and design-build. In order to develop contract documents that fairly and realistically balance the interests of project parties, AGC solicits input and comments from all segments of the industry. AGC maintains active liaisons with numerous trade and professional groups, including the Associated Specialty Contractors, Inc., American Institute of Architects, Engineers Joint Contract Documents Committee, Surety Association of America, National Association of Surety Bond Producers, American Insurance Association, American Bar Association, and American Arbitration Association, among others. AISE Steel News - Steel industry news, including the latest updates on North American and international steel producers, trade cases, and safety and environmental issues. Alliance For Healthy Homes - Working on lead poisoning prevention and other housing-related health hazards. American Society of Civil Engineers (ASCE) - America's oldest national engineering society represents more than 120,000 civil engineers worldwide. Barbour - The oldest and best-known provider of information services to construction industry professionals and those responsible for health and safety at work. Bechtel Corporation - One of the world's largest engineering-construction firms. Bechtel provides development, financing, engineering, procurement, construction, project management, operations, maintenance, and technical services. Big Dig, The - Everything about Boston's Central Artery/Tunnel Project, one of the largest, most complex and technologically challenging highway project in American history. Blue Book: Building and Construction Network - Directory of building and construction. Blue Book of Building and Construction - The industry's leading source of regional, categorized construction information and is available in print and online. Bricsnet - E-marketplace for the global building industry where building professionals access industry information, buy and sell materials, obtain mission-critical software applications, and share project information. BridgePros - Bridge construction and engineering, bridge project updates, links to other bridge sites, employment classified listings and a learning center. Builder Online - Beautiful house plans, home building products, home builders, and Builder Magazine. BuilderDirectory - Find home builder, home improvement, contractor, floor plans, manufactured and custom homes. Buildipedia - Architecture, sustainable design, DIY ideas and construction projects from around the world. Builders Without Borders - An international network of ecological builders who advocate the use of straw, earth and other local, affordable materials in construction. BuildFind - Builders network, industry resources. Building - National news magazine covering the building industry. Building Codes by State - A compilation of multiple construction related resources for each state. Provided by Carolina Services, Inc., a commercial space planning and improvement company in Charleston, South Carolina. Building Codes Online (MAD CAD at McGraw Hill) - A subscription based reference database containing building codes, knowledge-based design solutions and guidelines. Access collections of building, electrical, mechanical, plumbing, fire, and maintenance codes from BOCA, SBCCI, ICBO, ICC, and NFPA. Building Design and Construction Magazine (BD&C) - News from the nonresidential building industry; listings of the industry's top 300 firms; information on special events, award programs and links to industry associations; archives of BD&C articles; and information on products and suppliers. Building Energy Codes Program - U.S. Department of Energy (DOE) resource on national energy codes and standards. Building Research Establishment (BRE) - BRE is the UK's leading centre for research into all aspects of buildings and construction, and the prevention and control of fire. BuildingGreen - Providing information designed to help building-industry professionals and policy makers improve the environmental performance, and reduce the adverse impacts, of buildings. Publisher of Environmental Building News. Buildings - Commercial buildings industry source. BuildingWeb - Architecture, engineering, construction. California Contractors State License Board (CSLB) - Licenses, enforcement procedures, complaints and citations, bonds, license classifications, blueprint for becoming a California Licensed Contractor, license Q&A, baseline cost for type B construction, contractor license status check, and more. Protects consumers by regulating the construction industry through policies that promote the health, safety and general welfare of the public in matters relating to construction. California Department of Food and Agriculture information on fire ant infestation control, etc. California Department of Resources Recycling and Recovery (CalRecycle) - The state's leading authority on recycling, waste reduction, and product reuse. Caterpillar - The world's largest manufacturer of construction and mining equipment, diesel and natural gas engines and industrial gas turbines. Chimney Safety Institute of America (CSIA) - A non-profit educational organization dedicated to spreading chimney and venting safety information. Clark Reports - Clark Reports provides advanced notification of upcoming opportunity in the major construction marketplace. Two billion dollars of new project intelligence is distributed daily, providing comprehensive coverage of the North American construction market. Code Check - Help with building codes, plumbing codes, mechanical codes and electrical codes. Constructech - Technology in the construction industry. Construction - Construction marketplace; industry news. Construction Education Connection - Links to construction sites worldwide. ConstructionEducation - Online continuing education offerings for licensed and certified professionals in the engineering, architectural, interior design, construction, building inspection and land surveying industries. Construction Risk Management Portal and Library - Risk management resources and information including articles, newsletters, the ConstructionRisk Report, and a well organized arrangement of valuable websites. This site covers architects and engineers (A/E's) professional liability, architects insurance, engineers insurance, construction law and litigation, contractor claims and disputes, loss control, design-build liability, continuing education, and project management. Directories of claims consultants, expert witnesses, construction lawyers, and insurance carriers are also provided. Construction Specifications Institute - Provides technical information and products, continuing education, professional conferences, and product shows to enhance communication among all nonresidential building design and construction industry disciplines. Construction and Remodel Converters, Conversion Charts, Converter Programs - Useful tables and calculators. Contractor License Status Check - Provided by the California Contractors State License Board (CSLB). Contractor Resource - Directory of contractors and other building industry professionals, marketing serivces and business tools, including downloadable business policies, safety procedures, general business forms, construction contracts and agreements, and other forms. Contractor's License Reference Site - Find license requriements in all 50 U.S. states or find out if a contractor is licensed. Contractors Group, The - Business construction management solutions. Downloadable legal construction forms. Industry links, forums, legal connections, safety products. Crane Hot Line - The leading national marketplace for the crane industry. Design Build Network - Procurement and reference resource for members of the global architectural community and the construction market. Drawing content from its partner publications, as well as online exclusives, it examines the critical issues facing the industry today. Provides a thorough breakdown of products and services from leading architectural contractors from around the world, up-to-date news and press releases, white papers and detailed information on current industry projects and trends. Dormitory Authority of the State of New York (DASNY) - Provides financing and construction services to public and private universities, not-for-profit healthcare facilities and other institutions which serve the public good. 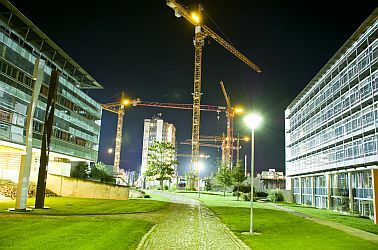 DYWIDAG-Systems International GmbH - A leading specialist subcontractor for post-tensioning and related techniques. Research in the fields of materials, structural engineering and construction methods. ebuild - Professional's guide to building products, materials and tools for home construction. e-worldconstruction - A news and e-commerce website for construction contractors, equipment manufacturers and dealers, and providers of services and supplies to the construction industry. The subjects covered include: road and bridge construction, earthmoving and civil engineering, the mining and aggregate industries, utility construction, trenchless construction, and commercial and non-residential building. Electrical Contractor Network - Locator for Licensed Electrical Contractors, Electricians and their Electrical Suppliers across the U.S. and Canada. Electronic Library of Construction Occupational Safety and Health (eLCOSH) - A collection of information on construction safety and health. Engineering News-Record (ENR) - Construction industry web site featuring headline news, searchable directories of engineers, contractors and industry job listings for architects, engineers, designers real estate developers, builders and contractors. Covers major projects, technological achievements, business conditions, markets, finance, costs, legislation, government, management, labor, construction methods, equipment and materials. Engineering News Record is part of McGraw-Hill's Construction Information Group. Also see Sourcebooks. EJCDC Contract Documents - The Engineers Joint Contract Documents Committee (EJCDC) includes the American Consulting Engineers Council, American Society of Civil Engineers, and NSPE's Professional Engineers in Private Practice division. The EJCDC develops and updates fair and objective standard documents that represent the latest and best thinking of practicing engineers and attorneys on the subject of contractual relations between the parties involved in a project. All EJCDC documents are prepared with the advice of legal counsel and reflect the experience of the practicing engineers. Emporis - A global provider of building-related information. Emporis collects data on buildings of high public and economic value, connects them with involved companies, and sets standards for this information. Product lines include building intelligence, online advertising, and image licensing. Excluded Parties List System (EPLS) - This site is provided by the General Services Administration (GSA) for the purpose of disseminating information on parties that are excluded from receiving Federal contracts, certain subcontracts, and certain Federal financial and nonfinancial assistance and benefits, pursuant to the provisions of 31 U.S.C. 6101, note, E.O. 12549, E.O. 12689, 48 CFR 9.404, and each agency's codification of the Common Rule for Nonprocurement suspension and debarment. Federal Contractor Misconduct Database - The government awards contracts to companies with histories of misconduct such as contract fraud and environmental, ethics, and labor violations. In the absence of a centralized federal database listing instances of misconduct, the Project On Government Oversight (POGO) is providing such data. Fluor - One of the world's largest, publicly owned engineering, procurement, construction, and maintenance services organizations. Fluor serves customers in a wide variety of traditional and evolving industries worldwide, including chemicals and petrochemicals; commercial and institutional; government projects; life sciences; manufacturing; microelectronics; mining; oil and gas; power; telecommunications; and transportation infrastructure. ForConstructionPros - Construction equipment, management, and industry news. Foundation and Associate Pte Ltd. - Sales, rental and back-up services for foundation and geotechnical equipment, i.e. hydraulic vibratory hammers, impact hammers, drilling rigs, jet grouting pumps and vibroflot. General Construction Company (GCC) - A marine/civil/industrial engineering constructor. InspectAPedia - Encyclopedia of building & environmental inspection, testing, diagnosis, repair. Insulation - Mechanical and specialty insulation industry resources. Also see Insulation Outlook Magazine. International Code Council (ICC) - Established as a nonprofit organization dedicated to developing a single set of comprehensive and coordinated national codes. International Conference of Building Officials (ICBO) Code Central - The leading source of building and related construction codes. In addition to providing the codes, ICBO offers a multidisciplined certification program, a variety of seminars, training manuals, videos and more. Irish Building Industry Directory - Over 10,000 companies: an essential guide to the Irish construction industry used by architects, building contractors, subcontractors, project mangers and engineers. Junttan Oy - A company specialized in the design and manufacture of hydraulic piling equipment. Kiewit - Construction and mining. Laing O'Rourke - The largest privately owned construction firm in the UK. We have offices in the UK, Germany, India, Australia and United Arab Emirates, with over 27,300 employees worldwide. Led by Chairman and Chief Executive, Ray O'Rourke. Lend Lease - One of the world's leading project management and construction companies. Mechanical Contractors Association of America (MCAA) - An association of approximately 2,300 mechanical, plumbing, and service contractors. Members enjoy MCAA's outstanding education programs, an expanding catalog of resources to help them manage and grow their businesses, periodicals and a website to keep them informed and connected, and business services to save them money. National Building Museum - U.S. cultural institution dedicated to exploring and celebrating architecture, design, engineering, construction, and urban planning. National Driller - Provides current industry news and information to the water well and construction drilling industries. National Electrical Code Book (NEC) - Every three years the National Electrical Code is significantly revised to keep pace with technology and enhance protection against electrical fire and shock hazards. National Fire Protection Association (NFPA) - Virtually every building, process, service, design, and installation in the U.S. today is affected by codes and standards developed through NFPA's true consensus system. Network Group for Composites in Construction (NGCC) - Promoting and developing best practice in the application of fibre composites in construction through their safe and responsible use and management. Northern Builder - Northern Ireland construction journal. Oceaneering International Inc. (OII) - Oceaneering is an advanced applied technology company that provides engineered services and hardware to customers who operate in marine, space, and other harsh environments. OETIO - A training facility in Ontario, Canada for hoisting and heavy equipment operators, including mobile cranes, tower cranes, overhead cranes, tractor-loader-backhoes, excavators and bulldozers. Parsons - One of the world's largest engineering and construction organizations specializing in infrastructure, transportation, planning, environmental, industrial manufacturing, and energy and chemicals for private industries and government agencies. Perini Corporation - One of the leading construction companies in the world, providing general contracting, including building and civil construction, and construction management and design-build services to private clients and public agencies in the U.S. and selected overseas locations. Reed Construction Data - Source for building and construction information on codes, products, projects, news, liability, management and more. Remodeling - Remodeling, home renovation, and home design. Report Card for America's Infrastructure - Reports by the American Society of Civil Engineers (ASCE) assigning the nation's roads, bridges, water systems and other critical foundations a cumulative grade of D and noting a five-year investment need of $2.2 trillion and examining the basis for those failing grades. Offers statelevel infrastructure data on a variety of subjects, including needed drinking water investment, number of deficient bridges and number of high hazard dams that lack an emergency action plan, as well as suggested ways for individuals to take action. Standard Construction Industry Contracts - Common families of documents are available from: American Institute of Architects (AIA), Engineers Joint Contract Documents Committee (EJCDC), Associated General Contractors (AGC), Federation Internationale Des Ingenieurs-Conseils (FIDIC), Design Build Institute of America (DBIA), Construction Management Association of America (CMAA). Each set of standard contracts has a unique set of risk allocations, intended uses, allocations of responsibilities, payment arrangements and overall control on project performance. The standard contract forms are usually not well-suited for a wide range of conditions without some revision to meet specific project conditions. However, a single form of contract is commonly used for all client projects. Standing Committee on Structural Safety (SCOSS) - An independent UK body established by the Institution of Civil Engineers and the Institution of Structural Engineers and others in 1976 to maintain a continuing review of building and civil engineering matters affecting the safety of structures. Statutory Construction Zone - Weblog devoted to statutory construction issues. Sweets Network - Construction and building product marketplace. ThomasNet - Search for U.S. manufacturers, products, and services. Thoughts on Adobe Codes - Model building codes, such as the Uniform Building Code (UBC), the Basic Building Code (BBC), and the Standard Building Code (SBC), always lag behind current knowledge of materials and construction practices. Within the so called "high tech" building material industries (e.g., steel, concrete, wood, and masonry) the lag time is not significant, with changes being made every two to three years. This is because trade associations (Portland Cement Association, American Institute of Steel Construction, National Forest Products Association, among others) are the main active ingredient in the model code writing process. It is not the same with earthen building materials. Provisions for the design and construction of adobe structures within the UBC, for example, have not changed significantly since they were first introduced into the code back in the late 1930's or early 1940's. Local "adobe codes", while they are more up to date than the model codes and address more aspects of earthen building practice, are for the most part sorely incomplete and either inconsistent or in opposition to latest knowledge (sometimes rediscovered older knowledge). TWI - Specialist knowledge in manufacturing, fabrication and repair technologies, structural integrity and corrosion management, materials and structural testing, inspection and maintenance, failure investigation, materials processing and training. U.S. Access Board - Also known as the Architectural and Transportation Barriers Compliance Board, the only independent federal agency whose primary mission is accessibility for people with disabilities: Building and Facility Design Guidelines, Transportation Vehicle Guidelines, Enforcement, and other resources and minimum guidelines and requirements for standards issued under the Americans with Disabilities Act (ADA) and the Architectural Barriers Act (ABA). U.S. Fire Administration - Provide fire-related public education, training, technology and data initiatives. U.S. Green Building Council (USGBC) - Provides policymakers and community leaders with the tools, strategies and resources they need to inspire action toward a sustainable built environment. Runs the LEED green building certification program for buildings, homes and communities that guides design, construction, operations and maintenance. World Housing Encyclopedia - Interactive, dynamic, web-based encyclopedia of housing construction types in seismically prone areas of the world. World Road Association (PIARC) - PIARC deals with road infrastructure planning, design, construction, maintenance and operation. The World Road Association has been founded in 1909. Today PIARC has 97 national or federal government members, 2,000 collective or individual members in 129 countries, and over 750 experts in 20 standing Technical Committees. The official languages of PIARC are French and English. Dredged Material Management Office (DMMO) - Information regarding navigational dredging projects processed through the DMMO in the San Francisco Bay area. The DMMO is a joint program of the San Francisco Bay Conservation and Development Commission(BCDC), San Francisco Bay Regional Water Quality Control Board (RWQCB), State Lands Commission(SLC), the San Francisco District U.S. Army Corps of Engineers (COE), and the U.S. Environmental Protection Agency (EPA). Dredging and Material Management - Dredging management and planning in EPA Region 2. Dredging laws and regulations, testing, material placement, marterial management, dredging contracts, dredging projects and more. Dredging News Online - A bi-weekly publication for the worldwide dredging industry. Dredging Operations and Environmental Research - Supports the U.S. Army Corps of Engineers Operation and Maintenance Navigation Program. Research is designed to balance operational and environmental initiatives and to meet complex economic, engineering, and environmental challenges of dredging and disposal in support of the navigation mission. Research results provide dredging project managers with technology for cost-effective operation, evaluation of risks associated with management alternatives, and environmental compliance. Dredging Operations Technical Support Program - Provides direct environmental and engineering technical support to the U.S. Army Corps of Engineers Operations and Maintenance (O&M) dredging mission. Dredging Statistics Program - Provides dredging data to support decisions pertaining to the U.S. Army Corps of Engineers national dredging program. The Dredging Information System (DIS) database contains information on all Corps performed and contracted dredging and supplies comprehensive dredging statistics to all dredging partners. The database offers a synopsis of information which includes project name, quantity of dredged material, type of dredge, method of disposal, government estimate, winning bid and bidder, and small business status. Great Lakes Dredge and Dock Company - High-profile dredging and construction public works projects. Environmental Effects & Dredging and Disposal (E2-D2) - A literature database comprised of technical references covering environmental effects of dredging and dredged material disposal projects. The database focuses on broad topics such as beneficial uses of dredged material, contaminated sediments, and effects of sediment resuspension and sedimentation on aquatic organisms and their habitats. Hydro INTERNATIONAL - Hydrographic surveying magazine. International Association of Dredging Companies (IADC) - The umbrella organisation for contractors in the private dredging sector with more than one hundred and twenty members with affiliated companies on five continents. International Dredging Review (IDR) - Coverage includes on-site visits to dredging projects, interviews with workers and managers, discussion of legislative and policy issues, news of the activities of suppliers, profiles of dredging contractors and suppliers, personnel notices, financial reports, and other news of interest and usefulness to people in the industry. MAGIS - Marine sand and gravel information. Information is provided for: sand and gravel extraction licenses; dredging contract and tenders; sand and gravel geological and geophysical information for the North West European continental shelf area; dredging industry news; dredging companies and their vessels; dredging equipment manufacturers, suppliers and their products; survey companies; survey vessel owners, operators and their ships; and more. Terra et Aqua - The official quarterly publication of IADC. Presents dredging related papers on important scientific and state-of-the-art subjects. Vessels That May Engage in Dredging (U.S. Code) - 46 USC Appendix - Shipping Sec. 292. World Dredging Mining and Construction Magazine - A monthly professional journal where international businesses and governing agencies can find information about all aspects and activities of the global dredging industry. World Organization of Dredging Associations (WODA) - WODA is a non-profit professional organization, dedicated to the exchange of knowledge and information related to dredging, navigation, marine engineering and construction. WODA incorporates three dredging associations: WEDA - Western Dredging Association serving the Americas; CEDA - Central Dredging Association serving Europe, Africa and the Middle-East; and the EADA - Eastern Dredging Association serving the Asian and pacific region. CNA Surety - Provides surety bonds in all 50 states, the District of Columbia, U.S. Territories, and many foreign countries. Department of the Treasury's Listing of Approved Sureties (Department Circular 570) - This Circular is published annually, solely for the information of Federal bond-approving officers and persons required to give bonds to the U.S.
National Association of Surety Bond Producers (NASBP) - An organization of over 500 independent insurance agencies and brokerage firms that specialize in providing surety bonding and insurance programs to construction contractors. Panamerican Surety Association (PASA) - A worldwide organization that includes most of the leading companies in the field of surety bonds, credit insurance and reinsurance. SBA Office of Surety Guarantees - Can guarantee bonds for contracts up to $1.25 million, covering bid, performance and payment bonds for small and emerging contractors who cannot obtain surety bonds through regular commercial channels. A surety guarantee, an agreement between a surety and the SBA, provides that SBA will assume a predetermined percentage of loss in the event the contractor should breach the terms of the contract. Surety Association of America (SAA) - A voluntary, non-profit, unincorporated association of companies engaged in the business of suretyship. It presently has approximately 650 member companies which collectively underwrite the overwhelming majority of surety and fidelity bonds written in the U.S.
SuretyBondNet - Facilitates the securing of state-required bonds and the replacement of stock and bond certificates. With more than 1,500 of the most common bond-related forms required by U.S. federal, state and local agencies, SuretyBondNet a leading surety bond service providing online bond issuance. Surety Information Office (SIO) - Free educational materials on contract surety bonds. This webpage last updated on Wednesday, January 6, 2016 6:22 PM.